Apps for anyone who need privacy in mobile! Chat in Privacy - with Emojis! 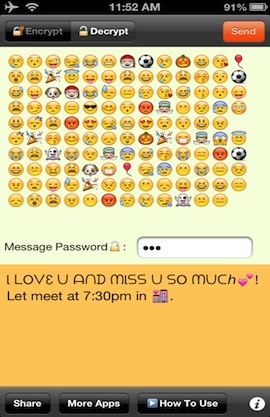 The best way to secure your messages with Emojis! Secret messaging has never been so fun - and colorful! Set a password for the message: only your recipient can decrypt the secret meaning. Prying eyes won’t realize that your funny Emojis are actually top-secret messages! 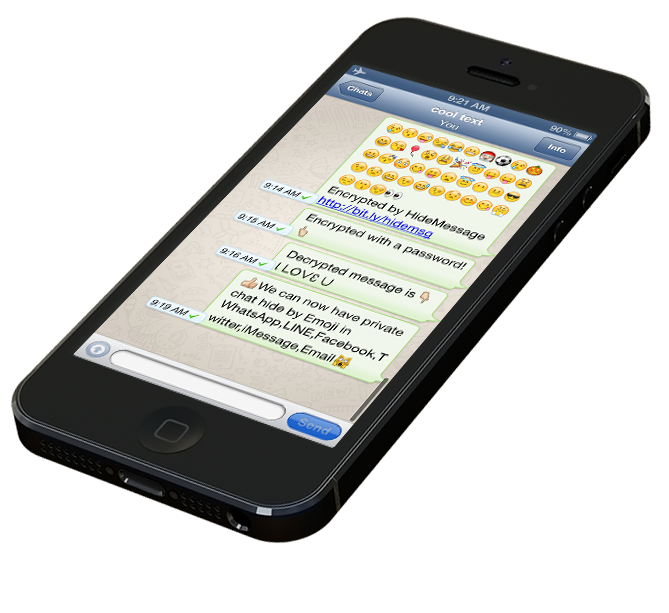 Chat privately using your favourite apps like Twitter, Facebook, iMessage, WeChat and more! Encrypt and Decrypt messages using the intuitive application. All you have to do is type your message, set a password and share - it’s as easy as 1-2-3... literally! Awesome. It is so Cool to have Emojis encoded my secret message! Awesome. It's just great! Now I can chat in privacy! Secret messaging has never been so fun - and colorful! We all use Emojis but did you know that they can also be top secret codes for another message? With HideMessage you can simply write a message that you would like to encrypt and send it within seconds. The smart and easy to use application will convert it into an Emoji. Once your friend or family member knows how to decode the message, they can easily decrypt it using your message password and the HideMessage app. This fun, intuitive application is great to use whenever you are telling someone gossip, important news, stories, jokes or simply anything that you would like to be top-secret. You can finally chat in confidence knowing that prying eyes will be unable to understand your messages! 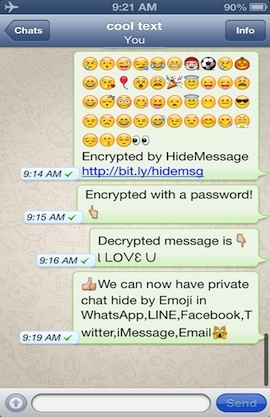 They won’t realize that your funny Emojis are actually top-secret messages! HideMessage. Available now via App Store.